Carotenoid Retention of Biofortified Pro-Vitamin A Maize (Zea mays L.) after Zambian Traditional Methods of Storage, Milling and Cooking. Vitamins and minerals are essential for maintaining important body functions and play a critical role as biocatalysts for almost all biochemical processes in the body. They are required by the body only in small quantities. However, the body cannot synthesize and store these micronutrients in adequate amounts and relies on a daily intake through food. A perpetual lack of these nutrients by the body can cause devastating health consequences and significant social and economic losses through impaired performance, retarded growth and increased risk of infection (Black et al., 2008). Vitamin A and iron deficiencies are a major public health challenge affecting children under the age of five and women of reproductive age. In an effort to eliminate these deficiencies, bio-fortified maize varieties with higher pro-vitamin A concentrations have been developed in Zambia under the Harvest Plus program in collaboration with the Zambia Agriculture Research Institute (ZARI) as part of the Agriculture for Nutrition and Health agenda. Bio-fortification is the application of plant breeding and agronomic approaches to increase the concentration of key nutrients in staple foods (Bouis et al., 2011). It is one of the food based approaches with significant impact in winning the fight against micronutrient deficiency. The National Performance Trials (NPTs) of the bio-fortified maize varieties were planted at the Golden Valley Agriculture Research Trust (GART) in Chisamba. These varieties had a pro-vitamin A target level of between 6-8 g/g dry weight - maize to provide 25% of the estimated average requirement (EAR) for adult women and preschool children 4-6 years (Saltzman et al., 2013). This study was conducted to evaluate the retention of the pro-vitamin A carotenoids in the Biofortified maize varieties after milling, cooking (nshima, sample and roasting) and storage under the traditional Zambian conditions. .
Four medium maturing varieties of bio-fortified maize with levels ranging from 6-8 g/g were evaluated for their retention of pro-vitamin A after storage, milling into maize flour and samp, and cooking as roasted maize and boiled fresh maize; cooked samp, nshima and porridge. The samples were saponified using 80% potassium hydroxide at room temperature. The carotenoids were extracted and quantified by the High-Performance Liquid Chromatograph (HPLC) with a PDA detector. Two mobile phases were used in a gradient elution system through a C30 carotenoid column (3 m, 4.6 mm x 250 mm). The solvents, methanol: water (92:8, v/v) with 10 mmol ammonium acetate and 100% methyl-tert-butyl ether were used. The data was analysed using STATA version 13.0. descriptive statistics including mean and SD of the duplicate analyses were calculated for the retention of the carotenoids. The means were compared using the Student t tests and one-way ANOVA. A P-value of 5% was used as threshold for significance. The results indicated that there was virtually no degradation of the pro-vitamin A carotenoids after the milling processes with >100% β-carotene equivalents (BCE). Milling into samp retained more carotenoids than milling into maize meal even though no significant difference was observed. The retention was higher for all the four varieties when the maize meal was cooked into nshima and porridge but a lower retention was noted when the maize was cooked as samp. However, most of the carotenoid degradation occurred in the first 15 days of storage of the maize as kernels and ears with a retention of 52-56% BCE which stabilized later after 6 months of storage to a consistent level of 30-33% BCE. Much of the pro-vitamin degradation in the Biofortified maize varieties happened during the storage period compared to cooking and the magnitude of this effect varied among the different varieties. Overall, the retention of the pro-vitamin A after the traditional processing methods was generally good. Bouis, H.E., Hotz, C., McClafferty, B., Meenakshi, J.V., Pfeiffer, W.H., 2011b. Bio-fortification: a new tool to reduce micronutrient malnutrition. Food Nutr. Bull. 32, S31-S40. 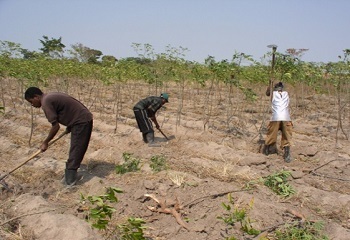 NISIR in Kitwe is using this micro propagation technique in various crops such as cassava, bananas, pineapple, sweet potatoes, eucalyptus, Artemisia, potatoes, and sugarcane. Activities in this research category include development of protocols for regeneration of whole plants from plant cells or tissue cultures, rapid multiplication of plants and conservation of germ-plasm of different crops. 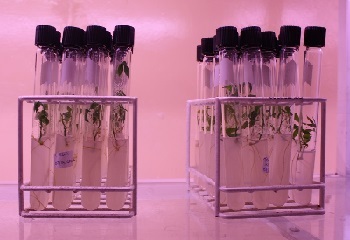 The Programme is using this micro propagation technique in various crops such as cassava, bananas, pineapple, sweet potatoes, eucalyptus, Artemisia, potatoes, and sugarcane. Activities in this research category include development of protocols for regeneration of whole plants from plant cells or tissue cultures, rapid multiplication of plants and conservation of germ-plasm of different crops. Cassava Crop Improvement Through In Vitro Mutation Breeding. Three cassava local varieties (Bangweulu, Nalumino and Mweru) are being investigated. The first material that was irradiated with gamma rays is now in the fourth generation under-going field evaluations. The objectives are to improve the nutritional characteristics and agronomic traits of these local varieties. This project is an IAEA sponsored project. IAEA has funded the training of staff and provision of equipment. The Zambian Government has continued to provide the counter-part funding for the execution of project activities. Micropropagation of Selected Eucalyptus Clones in Zambia. 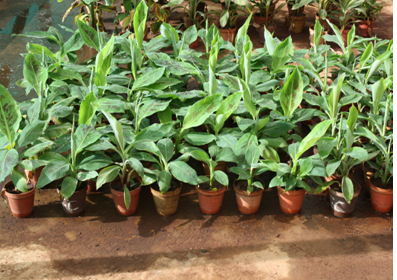 There has been an increase in the demand for plants with superior growth potential. 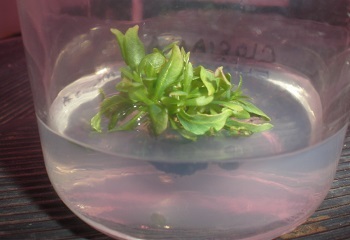 Micropropagation has the potential to provide very high multiplication rates to meet the demand of selected tree genotypes, with resulting short-term sivilcultural gains. The studies on micropropagation of Eucalyptus grandis and Eucalyptus cloeziana is a study that has been jointly funded by Zambia Forestry and Forest Industries Corporation Limited (ZAFFICO) and National Institute for Scientific and Industrial Research (NISIR). It is aimed at utilization of tissue culture technique to raise superior eucalyptus planting material for ZAFFICO for the establishment of seed orchards. Supplying tissue cultured disease free and superior planting material for cassava, sweet potato, pineapple, banana, sugar-cane and Irish potato. © 2017 National Institute for Scientific and Industrial Research.